I had a wedding locally so I travelled down the night before, then crept out early to experience parkrun Birmingham style. 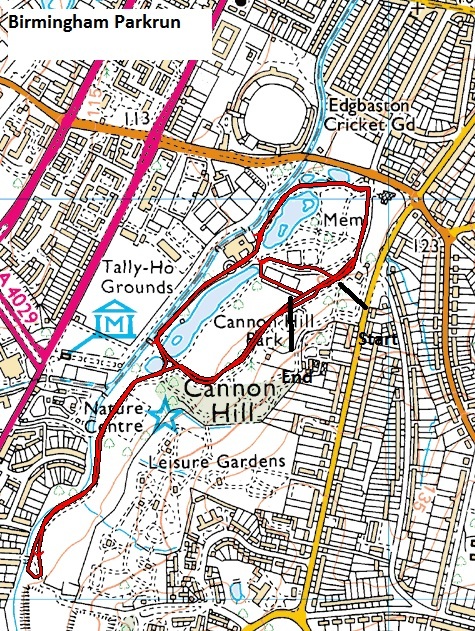 Cannon Hill Park is near the Edgbaston cricket ground. There was adequate parking for the 58 runners and plenty of loos. The race intro was given at the station (see below) near the end. The course was mostly flat with some slight inclines. The organisers were very friendly and marshalling and marking were excellent. Although I had the advantage of being fluent in the local language, communication should not be an issue for non-Brummies. Results were out the same day. Unlike Manchester, the Club runners wore their club vests. Also the proportion of Club runners vs. unattached was much higher than in Manchester. Introduction here and the end is on the grass just to the left.